This service brings my unique mixture of three backgrounds of education, training and clinical experience into one treatment room. Here, my patients allow me to use my orthopaedic and osteopathic assessments tools, my clinical reasoning and judgement, combined with my palpation, intuition and professional experience, to help improve their current situation. My education covered three similar, yet distinct disciplines; Athletic Therapy, Massage Therapy and Osteopathic Treatment. I can take many different types of approaches that are best suited for a person's unique needs or goals. In addition, I can also appreciate if a patient has been to see another practitioner and what approach they may have used to attempt to improve the injury status. This understanding allows me to quickly deduce what approach has been helpful, what has been not so helpful, what else needs to be addressed, what was missed, for example. This is not to say that another practitioner did not do their job. Rather, I get the benefit of seeing what has been tried and what the results were. Ultimately, collaboration and working in tandem with other types of practitioners means I get to help my patients fill in the gaps in the health care needs. Massage is the manipulation of superficial and deep layers of muscle and connective tissue to enhance the function and promote relaxation and overall wellbeing. Massage involves acting on and manipulating the body with pressure – stationary, or moving – tension, motion, or vibration, done manually or with mechanical aids. Target tissues may include muscles, tendons, ligaments, skin, fascia, joints, or other connective tissues, as well as lymphatic vessels, or organs of the gastrointestinal system. Massage can be applied with the hands, fingers, elbows knees, forearms and feet. There are over eighty different recognized massage modalities. Myofascial release refers to the manual massage technique for stretching the fascia and releasing bonds between fascia, integument, and muscles with the goal of eliminating pain, increasing range of motion and aiding fluid exchange within the tissues. Myofascial release usually involves applying shear compression or tension in various directions, or by skin rolling. Swedish massage uses five styles of long, flowing strokes to massage. The five basic strokes are effleurage (sliding or gliding), petrissage (kneading), tapotement (rhythmic tapping), friction (cross fiber) and vibration/shaking. Swedish massage has shown to be helpful in reducing pain, joint stiffness, and improving function in patients with osteoarthritis. It has also been shown to be helpful in individuals with poor circulation. Sometimes confused with pressure point massage, this involves deactivating trigger point that may cause local pain or refer pain and other sensations, such as headaches, in other parts of the body. Manual pressure, vibration, injection, or other treatment is applied to these points to relieve myofascial pain. Trigger points have been photomicrographed and measured electrically. These points relate to dysfunction in the myoneural junction, also called neuromuscular junction (NMJ), in muscle, and therefore this modality is different from reflexology, acupressure and pressure point massage where the typical aim is to rebalance energy systems and stimulate meridian channels. Deep Tissue massage is designed to relieve severe tension in the muscle and the connective tissue or fascia. This type of massage focuses on the muscles located below the surface of the top muscles. Deep tissue massage is often recommended for individuals who experience consistent pain, are involved in heavy physical activity, such as athletes, and patients who have sustained physical injury. It is also not uncommon for receivers of Deep Tissue Massage to have their pain replaced with a new muscle ache for a day or two. Deep tissue work varies greatly. What one calls deep tissue another might call light. When receiving deep tissue work it is important to communicate what you are feeling to the therapist if there is any intolerable discomfort. When it comes to sport preparation, many would agree that the Russians could be considered experts. Their training system includes four main elements: periodized physical training, psychological preparation, pharmacology and restoration. 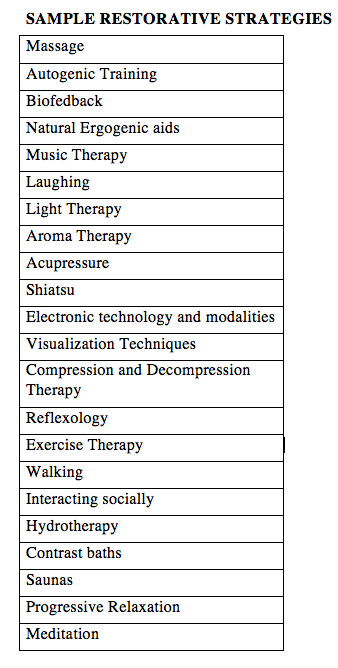 While many cultures have been using most of the known restorative techniques for thousands of years, the Russians were able to develop an entire methodology for applying these methods in a highly organized system in sport. Many of the techniques can be effectively applied outside the realm of sport because they form a general discipline more popularly referred to as stress management. The Chinese, Egyptians, Native Indians, Greeks, and many other cultures have all had traditions of restoration, or healing, with which it is synonymous. The word for therapy comes from the Greek healing specialists known as therapeutae. The word for healing also has an Indo-Germanic origin meaning ‘to make whole’. Now you may be asking yourself: how is regular massage different from sports massage? The main differences found can be found in the setting, the techniques used and their combination (therapist and sometimes condition dependant), the approach to treatment and most importantly, the consideration of training schedules to optimize therapeutic results. Traditionally, sports massage is performed onsite before, during and after a sporting event or competition. The goals of each situation are slightly different, specifically the pre and post event massage goals. Often, therapist assisted stretching will be performed and the athlete will be asked to provide resistance or work in the area being treated. The types of techniques chosen by the sports massage specialist ultimately aren’t different from traditional massage anyone from the general public might receive. The major difference comes from the combining of all techniques into a therapeutic and rational sequence needed to produce the desired results. A sports massage therapist must understand the physiological and psychological effects of techniques and their combinations to apply them effectively. It is important to thoroughly fill out an intake and health history questionnaire prior to receiving any treatment. Sometimes seemingly uneventful preexisting conditions can change the type of treatment you would receive. Having all the necessary information allows the therapist to make an informed decision about what a safe and effective treatment plan should be for your specific set of circumstances. Some cautions and contraindications to local and systemic massage include, deep vein thrombosis, chronic congestive heart failure, blood pressure irregularities, bleeding disorders, or taking blood thinners such as Warfarin, damaged blood vessels, weakened bones from cancer, osteoporosis, or fractures, rods, pins and wires from previous surgery, open uncovered wounds, fever and infectious conditions.